This power tower is suitable for men and women to build pretty body, pull up exercises, push up exercises to train their arm, breast, leg muscles,lose weight, training abdominal and arm muscles. Its max load weight is 350 lbs, and the height of the bar is adjustable from 1640-2150 mm. It fits for mostly people. 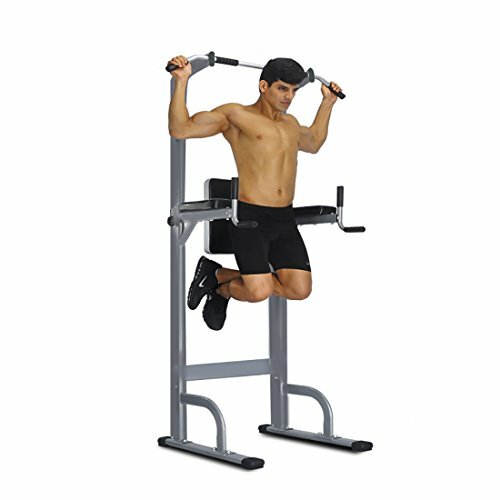 Adjustable height dip-Station Power Tower can help you realize your fitness goals. Weight capacity is 350 lbs,easy assembly. two dip handles' distance 22.44"
HIGH QUALITY MATERIAL:Made of oblate steel tube, pvc and foam,sturdy base. OVAL DIMENSION: 30.7"(L)x 42.5"(W)x 84.7"(H),Height can be adjusted from 64.6" to 84.6",two dip handles' distance 22.44", back cushion size:10.2"x 17.9"x 2.0",arm cushion size:11.8"x 4.7"x 2.0"
REALIZE YOUR FITNESS GOALS:High-Density arm pads keep your elbows comfortable.Training abdominal muscles,arm,back,chest,shoulders and leg muscles,Power Tower with dip station can help you realize your fitness goals. If you have any questions about this product by FEIERDUN, contact us by completing and submitting the form below. If you are looking for a specif part number, please include it with your message.